Welcome Warriors (and mundanes) to the IKV Melota Downloads main page. 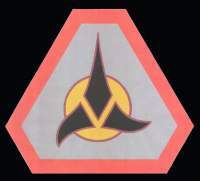 From 2000 to 2009, I as Communications Officer, Webmaster, and Videographer of the KAG Ship IKV Melota have made available a premiere website for the Klingon Assault Group and Klindom in general. With pride I have offered a website with Video Downloads pages with over a gig of klingon video content presented WITHOUT advertisement, popups or popunders. period. You may possibly notice a four year hiatus in new videos. After four years (two elections) of experimentation, it will take time to get back into the film making business. Please be patient. Always run a virus check on downloaded products! Download this to calculate download times. that weaker species cannot handle. If you are "sensitive" or "politically correct", then you are on the wrong web page. This is a page for KLINGONS. as the website is being re-organized at a folder level. The Real Media shall hopefully be returned as WMV format. so that the progession of combat and video tech can be shown.